Tom coauthored the book Satellite Cadet Squadron with his CAP parents. “Going through the ‘Fallen Diamonds’ file, it seems you have little regarding a friend of mine, Ted Deringer. Although we lost contact and drifted our separate ways (it was years later I learned of his untimely death), perhaps I can shed a little light on his life as a cadet. I dont have his exact birth year, but it should be around ’63 or so. Many may look to this section of the page and seek information on his death: In that I can’t help. I think he developed some heart problem, but am not certain. But I can comment on his life. “We spent ten grueling days together one summer in that unforgettable trial that was Hawk Mountain Ranger School in 1981. He’d travelled all the way to Pennsylvania from Florida to attend, and this was back in the days when ‘Ranger School’ was stricly a Pennsylvania thing. (Long before it became a national activity or got press in CAP News). I was immediately impressed by his drive and dedication to the CAP program that drew him to the toughest training around, and he fit right in from the outset. He had that kind of personable, outgoing manner that made others feel they’d known him all their life, and he way always found something positive in even the most mundane tasks. (In those days, as you may recall, we did things like haul thousands of rocks from the stream beds to line our camps, trails, tents, and anything else that could maintain a linear dimension). “We had the long climb up the side of the mountain, and one of his fellow ‘Flat-landers’ from the Sunshine state was having a terrible time with the near-vertical assent with full packs for the extended survival trek. Ted stayed with his fellow cadet (who was by now experiencing the less-than-pleasant comments from the rest of the team ‘requesting’ him to keep up with the group), and I watched as Ted provided the kind of encouragement and moral support that helped the chubby kid make it to the top. Ted carried his own pack, and when the hill got too steep for his companion to climb, burdened by the heavy gear he was carrying, Ted offered to take it from him and we ended up taking turns carrying an extra pack up the steepest part of the climb. It was one of the most noble, selfless things I’d ever observed — and that’s the kind of person Ted was. Even when we were on the “survival” part of the hike, with nothing to eat and everyone’s spirits low, he seemed to be the one who would buoy morale with his enthuastic optimism. He was the guy who would pull a candy bar out of his web gear and offer the first bite to his comrades. It was more a need to prove to himself that he was willing to go the extra mile in order to accomplish the assignment. That was it. There wasn’t any grandstanding in his thoughts or actions. If someone thought that way … they would just have to learn differently by observing him over a long period of time.” … “I don’t have to do many of the things that I do, but I figure if it will help others learn–how to do things the right way, well, then it’s worth it…. See Theodore J. Deringer’s Spaatz Announcement in the Florida Gators CAP Newsletter. in the FLWG newsletter archive. 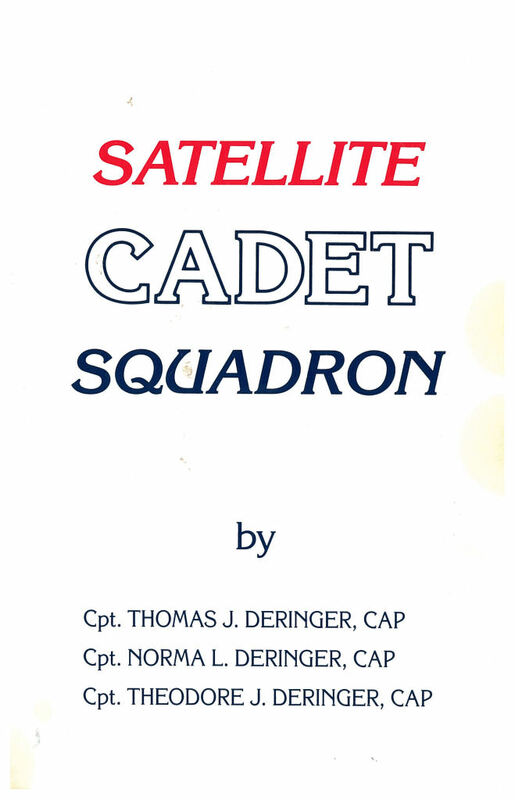 Thanks to Mike Murphy, #115, here is the back cover of Satellite Cadet Squadron, and the story of Ted Deringer and his CAP family.